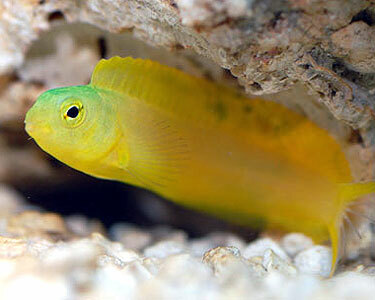 The Canary Blenny is a very yellow fish that will swim around and then land and stay on rocks. They will eat most food in the water column and also pick off of rocks. They have fangs that they will use to bite pieces of food off of rocks. Should be kept with peaceful fish; may fight with others of its own kind.